"Ku du ramm!" Wakka's glower darkened even further at Auron's faint smirk. "You think this is funny, ya? Yeah, I'm Al Bhed now. They don't lie to their own people, they don't guilt you into being good with a pile of religious crap, and they care about protecting family more than anything in the world, Sir Auron." Auron was impressed by his ability to heap so much scorn onto a simple title. "So, you supposed to 'give me her love.' Now that's funny. Like you could ever give love to anybody." Wakka was all but bellowing now. "And you know what? If it wasn't for you, we wouldn't even be having this conversation!" Auron ignored the absurd tautology. "Lulu would still have chosen this path. She followed Yuna." "And so that's supposed to make it all right, eh? Lulu stuck in that thing forever, while I try to make the life she can't, raise a family, be a good daddy, be happy all the time she's out there somewhere bein' Sin?" Better than going to Zanarkand, Auron wanted to say, but that wasn't true. Raising Tidus for Jecht's sake had been the only oath he had ever gotten right. The boy had died, but at least he had lived. Releasing the trigger to wipe his eyes, Wakka went on in more subdued tones. "You saw little Yunie, ya? Sometimes she tells me what Lu's thinking, where she is right now making rain or snow or the flowers grow. I donno whether Yunie's making it all up— she's only seven— but she's got the talent. She's gonna be a healer. But no way is she gonna be a summoner. And I'm not letting anybody mess her up with talk about aeons and guardians." "So you've been protecting her with a lie, and now you're willing to kill to protect that lie?" Auron said. "Sounds familiar." "Shut up." Wakka resettled the weapon on his shoulder and braced. "Man, you better not come back like Seymour." I can't promise that. Could he? Pyreflies skittered in the back of his mind, insects gnawing at his will. Rikku's voice rang out, banishing their insidious whine. "Wakka, no." The weapon's muzzle dipped as Wakka looked up towards the top of the dune where Auron had just taken a tumble. "Rikku," he said, cupping the name with tenderness. "I... I know it's wrong. But he deserves it, just like Seymour. Maybe more. Seymour was crazy, but Sir Auron—"
"He doesn't mean to hurt anybody, any more than Lulu does." "Yeah, but…" He screwed up his face. "I won't let him hurt Yunie. I won't let him hurt you." "You're not a murderer, Wakka," she said quietly. "Yeah, but…" He slumped. Slowly his bluster drained away, sinking through desperation to defeat. "Damn." The gun thudded to the ground, narrowly missing a row of cabbages. Auron had forgotten just how quickly the big man could move. Before he could rise, Wakka reared back and landed a punch across his jaw that felt like it had Armor Break behind it. Auron went flying and struck the slope behind him. More vegetables paid the price. He found himself staring up a pair of long skinny legs and shut his eyes quickly before Wakka found another reason to hit him. "You look well," Auron said to both of them, and meant it. A third time he tried to pick himself up, stiff and wobbly-kneed. Being hit by both Wakka and Lulu on the same day was probably some kind of accomplishment. "Oh for goodness' sake," Rikku said, coming forward to help him up. "Anybody else running around out there? We've already found whassername, the chocobo lady." "I don't know," Auron said. One of the little girl's remarks suddenly clicked. "Elma. Is she alive?" "I don't want Sir Auron in our house," said Wakka. "And I don't want him bumbling around in the garden like a drunken shoopuf." Rikku kicked at the ungainly weapon lying among the cabbages. "C'mon, Wakka. We can handle it. He can't make us do anything we don't want to, right? He's a big jerkfaced idiot who goes straight for trouble and doesn't have the sense to avoid a battle that's gonna get friends killed, but he's not gonna eat the kids." He stooped to pick up the weapon and slung it over his shoulder. "Maybe... but if he says one word to Yuna about—"
"Then you hit him." She patted his arm and turned back to Auron. "So yeah. Elma's chewed up pretty bad, but I think she'll make it. Looks like she went through an ore shredder. What hit you guys, anyway?" "Oh. Right." Rikku made a face. "Let's get you back to the house. I've got some Al Bhed potions left, though I just used a ton of 'em." She elbowed Wakka. "You gonna be okay if I send the kids back out to finish collecting ingredients? At this rate we're gonna need 'em sooner rather than later." "I guess. 'Specially if he's in the house." Rikku winked at Auron, reached for Wakka's hand and set off towards the orchard. Lagging behind, Auron watched the easy way they moved together, clasped hands swinging as Rikku trotted beside her trudging husband. Despite Wakka's fuming, Auron saw in them an echo of Anna and Braska, and perhaps of Yuna and Tidus had she not answered to a greater calling. No wonder Lulu had been so reluctant to bring him here. She was still a guardian. "Hey," Rikku said. "Lulu's not still hanging around here, is she?" "Phew. We still get the rains, but she never comes anywhere near us. At least, not since—"
"She's always been careful," Wakka mumbled. They followed a path up a huge dune covered with a thin layer of chalky soil, blue-eyed grass and a stand of young trees about twice Auron's height. Rikku picked a few mangoes as they passed. Beyond the small orchard, they came to a circular courtyard paved in sandstone, freshly swept. Auron guessed from pipes rising out of the pavement that it covered a large cistern. The lush vegetation of the oasis petered out here, but the flowering grass overflowed the trees and spilled out into the sand. Behind the courtyard was an even larger dune, straddling the transition from oasis to desert. Its steep face was pierced by a thick sandstone arch, supporting a short tunnel with a door at the back. Recessed windows framed by smaller stone arches interrupted the dune's sides at regular intervals. A crop of antennas, pipes and vents marked the buried structure as Al Bhed, but the soft green carpet of grass anchoring the roof gave the house a more welcoming feel than most Al Bhed architecture. "Well, here we are!" said Rikku. "Pretty neat, huh? We started a fad with it." "Hm." Auron had forgotten what a human home looked like. The last one, and in fact the only one where he had spent any length of time, was Jecht's houseboat. As if stumbling across one of Jecht's spheres, Auron remembered with a jolt the pride he had felt when passing such places on Braska's pilgrimage, be it Luca's townhouses or the mangrove huts of Kilika, Macalania snow-cabins or the lavish mansions of Bevelle. Homes like these had been what Braska and he intended to die for. Wakka spoke up as their footsteps drummed across the hollow pavement. "So, Auron. Where you been, anyway?" "For thirteen years?" Rikku said. "Doing what?" "What Ronso?" Wakka said belligerently. "Didn't Seymour wipe 'em out?" "The warriors fell," Auron said. "The children and some of the elders survived." Looking after the survivors of Seymour's genocide had been the least Auron could do to honor Kimahri, after he had spent ten years fulfilling one of Auron's broken promises. Gagazet's lonely heights had given Auron a place to rest and to fight, far away from the madness of autographs and spherecams, fiend hunting and mall security, and all the other odd jobs he had used to pay for Tidus' expenses until the boy grew up. Training Ronso cubs had been engrossing, enjoyable despite the broken bones. It had helped keep him sane. The door opened onto a large oval living room with sofas and squishy chairs at one end and a kitchenette/dining area in the other. In the middle of the floor was a hot tub covered by a locked grating. Tendrils of steam curled up through the grill to humidify the dry air. An archway opposite the front door revealed a curved hallway wrapping around the main room, leading to other rooms cut like spokes into adjacent dunes. Vidina and Yuna crowded forward and wrapped around their parents' legs, bombarding them with questions. Yuna, at least, seem delighted the "red man" was staying for now. They bounced from one piece of furniture to the next, tagging after their parents until Rikku shooed them out to collect herbs. A five-year-old boy and a four-year-old girl, Etta and Mbelu, completed Wakka and Rikku's growing family. These two seemed less interested in their visitor than in building a block city in the deep window over the sofa. Rikku pressed Auron to take a potion and disappeared into the back of the house while Wakka bustled around the kitchen, keeping an eye on their guest while preparing lunch. Auron sank into a chair that resembled a shaggy brown bag. He nodded when Rikku popped her head out of the hallway to say that Elma was still unconscious, and that "you boys" were to keep out while she finished changing the woman's bandages. By the time the light meal was served, the legendary guardian was snoring. Meta: In an optional cutscene in FFX, Rikku explains to Tidus that Spirans usually get married young, and she's already making plans. Which probably didn't include a lunkheaded Yevonite 8 years older than herself, but as Wakka says, "things happen." I will lie here having Wakka Emotions for the foreseeable future. Just, god, it would be those two who would manage to live with it, Wakka who would mostly be able to not think about how if he'd said the right thing for once, maybe Yuna would have taken him with her instead. He mostly gave up on turning Yuna back a long time ago, but that is just possible enough to eat away. Anyway I don't usually ship this, but now I kind of do? Also you saved Elma I forgive you completely!!! 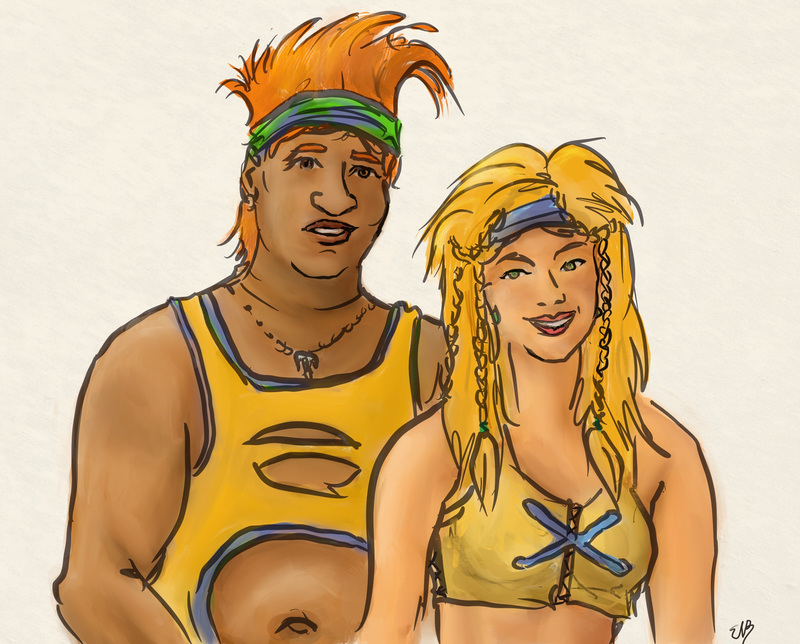 I didn't originally ship them either, but both of them spend a lot of FFX caring about family, and during that whole sequence with the Guado attacking Home Wakka has a very interesting arc coming to sympathize with Rikku and be outraged on the Al Bheds' behalf... a long way from where he started out. And yeah, I was resisting spoilers, but I would never bump off one of the few obviously queer characters in the story, especially when I've wound up writing multiple straight ships! Okay now I remember what happened to Elma, haha. I LOVE this portrait of Al Bhed home life and domesticity. It always made me really happy that Lulu was using her goddess-powers to create a little hidden utopia for the Al Bhed where they could live and farm and build things in peace, after generations of persecution and having to live as nomads. My friend who was the Rikku to my Yuna in our high school/college friend circle and I used to have this running joke that in the epilogue (fanon or otherwise) "my" characters always ended up dead and "hers" always ended up happily married with a small mob of children (one of whom was invariably named after Dead Mintywolf). So when I read this the first time I was like HOW DID THIS AUTHOR KNOW???? Later I did remember that Rikku has a conversation with Tidus about wanting a bunch of kids in the future, but it was still really funny. Wakka's character is spot-on here too. I like what you've done with him, because a lot of fans are uncharitable to him. He's still kind of in an "antagonist" role to Auron, but for completely believable and sympathetic reasons. Gack, synchronicity is a funny thing! But yeah, basically I was giving Rikku her wish. Her "unruly brood" first cropped up in those Yuna/Lulu shortfics as a throwaway line, but then I started toying with the idea. I don't usually care for kidfic and domesticity tropes, but Rikku often gets reduced by fandom and X-2 to a much too shallow character, whereas the little glimpses of her we see in FFX show she is probably the most responsible person in her family (except for Yuna ;). I have come to love Wakka as one of the best male characters in FF. He's so ordinary in his flaws, stubborn and hidebound and a bit oblivious, but he is also a genuinely caring guy. He means well, he just needs someone with brains to help him past his own blind spots. As for Lulu protecting the Al Bhed, yes, she's being their avenging angel of death as well as Yuna's, keeping them safe from future persecution. But the garden is mostly for Rikku and Wakka's family to make it easy for them to live apart from the rest of the Al Bhed. I hadn't entirely thought it out when I first wrote this, but their relationship with Elder Cid is... probably a bit strained, although not as badly as when Cid's sister married a summoner.